Friday Fun: Google Street View "Outtakes"
You never know what Google Street View will find — some of it is pretty funny and some of it is downright embarrassing. Some random surfing today brought me to this article posted by the Telegraph in the U.K which also includes a slide show of more than a dozen street view images that have been pulled from the service following complaints or requests since the service went live recently in the U.K. and other European cities. Not sure if the image with Paddington Bear in Trafalgar Square was pulled — I found it cute and appropriate. 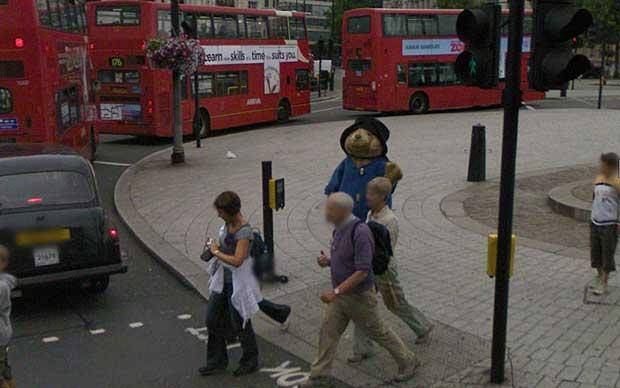 But then again, there is some question about whether Paddington was actually stalking the Google cam team. How fun that they built in a Where’s Waldo game to the Street View as well — and even cooler that Waldo was found! Of course, many questions could be (and have been) raised about privacy and the “Big Brother” aspect of street views… but that is a whole other post for a different day. Entry filed under: Uncategorized. Tags: Friday Fun, Google. Focus on photography	Clutter Lovers Unite: Don’t stress about the mess! Hi, I find this blog trough SE Google. Great, I like it.